A blend of Harry Potter vs Star Wars, except the wizard in this tale is a boy who thinks he`s a normal teen until a lightning strike awakens memories that he`s an extraterrestrial born here for a special mission – and his senator father is also not of this world. Growing up somewhat reserved and feeling unwanted, his life suddenly changes one day when he is confronted by a sinister entity that seems strangely familiar. 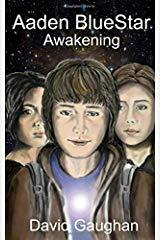 Walking in the park that day with his best friend Fleur and his sister Tiffany, who are more like his spiritual protectors, Aaden’s superpowers are awakened when the entity Belial tries to destroy him with a lightning strike. With past life memories suddenly expanding his awareness, he discovers his connection with other worldly beings and his senator father and their role in confronting their arch enemy. Their success in their mission not only determines the future of our world, but also the lives of all humanity. Having climbed the Great Pyramid of Cheops (and getting arrested doing so), some of his other world experiences included riding camels in the Sahara Desert, white-water rafting at the top of the Ganges river, fire walking on a weekend retreat, hot air ballooning in the Cappadocia Region in Turkey and visiting ashrams in Northern India. Much of David’s overseas travel has been fueled by his keen interest in metaphysical subjects.